I already called out one Arlington Condo builder with my: Beware: New Constructions Illegally Not Disclosing Seller Subsidies. After that article came out, that builder suddenly started disclosing their $50,000 seller subsidies. And Builder: Guaranteed Lowest Price* where builders use subsidies and decorator allowances so as not to technically drop the sales price and have to recalibrate earlier contracts. Well I found yet another builder expanding on those tricks. This time the builder will list a property and the day it closes, it will withdraw the listing! Why? Because when a place is listed for $599,900 and closes for $529,000, they don’t want the public to know. Also the tax records (where I found the sale) does not allow for disclosure of the seller subsidies (the MLS does require it). So not only are they hiding a $70,000 price drop, the seller subsidy could range from $5k to $25k. By hiding this data, the appraisals can be kept up for future closings! Sounds to me like fraud, but that is just my opinion. And that is code for JAILTIME. That is FRAUD. If you suspect som ething fishy is going on, pay the extra $200-400 and get your own independent appraisal (without mentioning what the lender’s appraiser came up with). If they come in over $15,000 different, somebody got some explaining to do (insert Ricky Ricardo voice). After the independent appraiser’s report is complete, ask him to look at your lender’s appraisal report. If he says it appears fraudulent, report it to the FB I. Yes the FBI is very interested in hearing about fraudulent lender practices. Now one last word about lenders. I don’t want you to think that they are all crooks, or even that some are. But you have to understand the phrase “fiduciary duty.” That is defined as “The legal responsibility for investing money or acting wisely on behalf of another.” Agents have that duty with their clients… but lenders don’t. Again, lenders, albeit nice, helpful etc etc, they do NOT have a fiduciary duty to look after your best interest. Their duty is to their employer. So know your rights, get that second appraisal and don’t get bullied into a fraudulent loan. Feel free to forward this to friends. 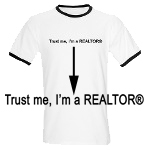 To subscribe to this blog via email, go to http://blog.FranklyRealty.com and look on the right side of the page to sign up. I would not want to be in concert with these builders schemes in a few years when they find themselves in court. Withdrawing a contract – another trick in the bag……………. Reason number 485 why I do not work with builders. Frank, one thing that bothers me is when a large builder offers the house for less if they use their lender. It is so full of junk fees, that they quickly make up the difference in the price of the house. I tell my clients it is NOT a good deal. Hi Frank, wow, you reminded me of how much I love to do new construction for builders!.. You have two strong topics going on here: hidden seller concessions (i.e. subsidies in your market) AND using their own lender and appraiser to commit fraud in order to close. In our market, builders are a major pain to appraise, usually. For new construction the comps should also be builder sales (i.e. new construction).. apples to apples.. right? Prying the info from the builder regarding sales prices, upgrades and sellers concessions are a pain. In my experience, and in these parts, you won’t find out about the concessions. They call it 50K’s in upgrades… so I ask for comps with similar upgrades. but still, builders make their own rules, contracts are very one sided and can hide fees and money of they want. As for sending your own appraiser (which is a great idea), builders may not give you any info, they want to know what home your appraising. I tend to tell them the houses model name and report that the info is confidential. they don’t like that at all, and sometimes it’s like a cat and mouse or negotiation.. i give them a little info, they give me a little info. I agree 100% with your opening thoughts on how these subsidies are not reported on the tax rolls and skew the comps for future sales. not the best thing for the market in general. I got a different price list of the options available from my client than what I got when I went into a sales office for a new construction at the time of my appointment! Very Huge differences for upgrade options. The price list from my client showed higher prices than the one from the sales office. When I asked about it, I was told it was a misprint. SURE! Yes buyers need to watch out for seller concessions and the reinvented (it was an old trick long ago) “decorator allowances”. It would, indeed, be helpful for a buyer to get an independent appraisal. But, what is the buyer going to be able to do if the appraisal is below contract price?? What the consumer can do is limited with no financing contingency in new home contracts, getting a low appraisal isn’t going to do much for the buyer except perhaps make them want to walk away. Some builders might negotiate late into a contract. I’m just wondering, from the perspective of most buyers, what is the benefit of a low appraisal? Remember back in the good old days of 2004 when a new home appraisal would come in $100,000 above the contract price? That’s over with. An interesting fact in our market…as of October 1st, new home sales reps in Maryland are required to be licensed agents. An inside source tells me that they are pushing a lot of ethics training on these salespeople during their pre-licensing courses and making it clear that they will be held to the same standards as other agents in the market…Interesting to see how this will all shake out. One thing I know (having started my real estate career in New Home Sales), it can be difficult to comp a new property in a new neighborhood sometimes…There were many times where there were no comparable properties – the closest even close to new neighborhood was several miles away and the neighborhood we were building was surrounded by old homes. The first few homes in those neighborhoods were always a challenge to get independent appraisers (as well as the builder’s preferred lender’s appraisers) to appraise. I always recommend to my clients who are considering new construction to get independant inspections and appraisals and to shop the loan they are offering you. Compare apples to apples on a GFE and make sure you are getting the best deal…separate of any incentives the builder is offered that are tied to using their lender. I love when builders would randomly jack the prices of pre-built homes in a development just because ‘area prices had increased’. That’s simply not going to fly in an honest appraisal that counts on historic sales data of the subject’s development. Friends of mine were about to purchase a home in a new development. The construction company kept adding unreasonable pricing for the house they were interested in until they finally backed out. The construction company simply shrugged it off and sold it to the next interested buyer. Perhaps (hopefully) that is a sign of the past with current inventory. I like Mortgage Fraud Watchlist for news and reporting of fraudulent acts. If you do get an appraisal, try and get it BEFORE they get an appraisal. And ideally from somebody on their list of approved appraisers (ask another lender in that company). Frank, great post as usual. I would also take any figures Builders give regarding # of units sold or left for sale with a grain of salt. At 1800 Wilson they told me they had 5 units left to sell implying that was the end of their inventory. Of course I realized soon that 5 was the amount of units they had left to sell because they were only referring to the 8 that were released originally(number pulled from hat). After those were sold they’d release more and only have several units left for purchasers to get in on if they hurried….Bait and switchy to say the least. It is very hard sometimes to explain a 50,000 dollar concession and when it is gave as an incentive to use the builder’s lender, who a lot of the times is the builder, with that said, an appraiser has their work cut out for them. I always ask how much it really cost to build, also competing new developments need to be reviewed. Because it is very hard to compile the worth of a builder “add on” package an appraiser is almost required to compare the basics. Whats funny is just Friday on CNBC I saw an interview where the person was stating the difficulty of getting an appraisal value to come in due to the appraisers being more conservative and that he was unclear if it was stemming from the lenders or the appraisers. Bet a Georgia based builder wish they disclosed more and maybe more should watch that case closer.